We’re glad that WHO has come out with this statement, but we’re not surprised. We’ve been following the literature for some years. In 2013, Dr Morley Singer alerted us to an article in the highly-respected peer-reviewed and journal, CA: A Cancer Journal for Clinicians. The article said that people who applied pesticides – or were around pesticides – were more likely to get cancer. [HERE’s the link to the article: Increased cancer burden among pesticide applicators and others due to pesticide exposure.] We wrote about it here: Pesticides and Cancer, Glyphosate and Gut Bugs. We hope that the WHO’s determination will make the Natural Areas Program (NAP) re-think its use of herbicides. 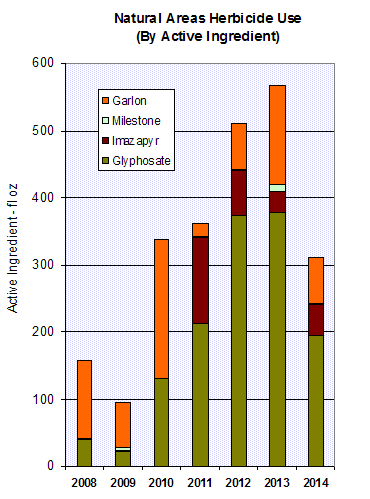 Glyphosate, i.e. Roundup/ Aquamaster is possibly carcinogenic, and is on the list of herbicides to be evaluated as an endocrine disruptor. Besides the risk to the public and their pets, their own staff are in the front lines here. 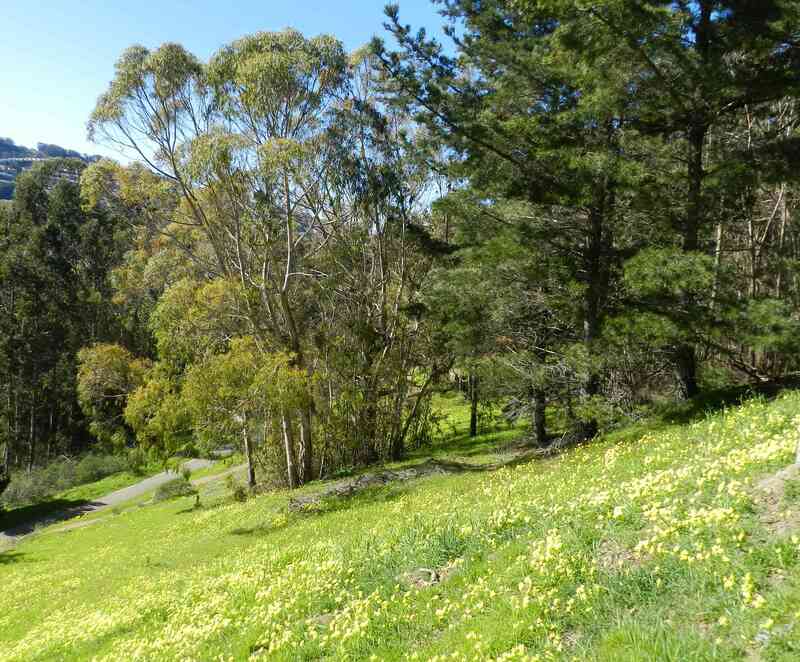 The San Francisco Department of the Environment (SFDoE) assigns a ‘Tier” ranking to all the pesticides that are legal for use on City-owned property. Tier III is Least Hazardous, Tier II is More Hazardous, and Tier I is Most Hazardous. Roundup/ Aquamaster is Tier II. We again ask SFDoE to consider reclassifying it as Tier I. But we would be disappointed if NAP merely substituted other herbicides instead. Imazapyr (Polaris), classified as Tier II, is problematic because it doesn’t go away. It can continue to poison plants and impact the environment for a long time after it’s applied. Also, it moves around – it’s mobile in the soil. Some plants actually push it out through their roots. Its breakdown product is a neurotoxin. Milestone VM – aminopyralid – is also classified as Tier II, and it’s even more persistent than Imazapyr. It’s so persistent that animals can eat it, and their poop is poisonous to plants. It’s banned in several places because of its threat to groundwater. Besides the risk to humans and their pets, pesticide use doesn’t benefit native wildlife – whether insects including butterflies, birds, or animals. It doesn’t benefit native plants, either. All that happens is that other plants best-suited to the area take over, and those are usually other ‘invasives.’ Or worst of all – nothing grows there, leaving bare poisoned slopes. We call on the Natural Areas Program to stop using herbicides. This “news” should not be a surprise to anyone who has been following the history of glyphosate. But this formal recognition will help those who don’t doubt its toxicity to convince those who have been using it to quit doing so. 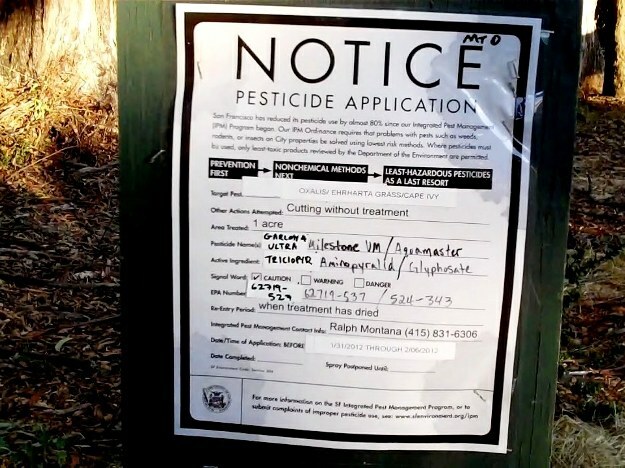 I hope the San Francisco Forest Alliance will make a formal, written request of San Francisco’s IPM Program to remove glyphosate from its list of approved pesticides. As SFFA knows, San Francisco has made a formal commitment to the precautionary principle which obligates it to quit using pesticides that are considered harmful to human health. The precautionary principle is codified law in San Francisco. Now let’s see the Department of the Environment enforce the law they insisted San Francisco pass.